The thought of warm salad either makes you feel all comfy cozy inside, or makes you think of a bowl of slimy boiled lettuce. Warm salads are actually hearty, healthy comfort foods that are perfect for cold weather. They’re delicious pick-me-up rainbow medleys of fresh crisp ingredients combined with savory warm ingredients like steamed roots, seasoned beans, cooked ancient grains, wilted greens or warmed creamy dressings. They’re bursting with nutrients, flavor and color, and are the perfect low-cal one-bowl entrée that you’ll look forward to on chilly days outside. In a small bowl, whisk together all of the salad dressing ingredients, and set aside. In a large rimmed baking sheet, toss the shallots with 1 Tbsp of olive oil and season with some salt and pepper. Roast in the oven for 20 minutes. While the shallots are roasting, tear the mushrooms in half and toss them in a bowl with 1 Tbsp olive oil, salt and pepper. Once the shallots have been roasting in the oven for 20 minutes, add the mushrooms to the roasting pan. Continue roasting in the oven for another 10 to 12 minutes, until the mushrooms are golden. Spread out the chopped kale on a serving platter, and top with the warmed mushrooms and shallots. Drizzle with the vinaigrette and sprinkle with crumbled goat cheese and walnuts. Preheat the oven to 350 degrees. Place the sweet potato cubes and onion wedges directly on a baking sheet and drizzle with the oil. Sprinkle over with chili powder, paprika, salt, and pepper, and toss everything with clean hands directly on the pan to coat the potato cubes on all sides. Roast for 20-25 minutes, stirring every so often to keep from burning. When the sweet potatoes and onion are golden brown on the outside, remove from the oven. While the potatoes are baking, cook the quinoa according to package directions. 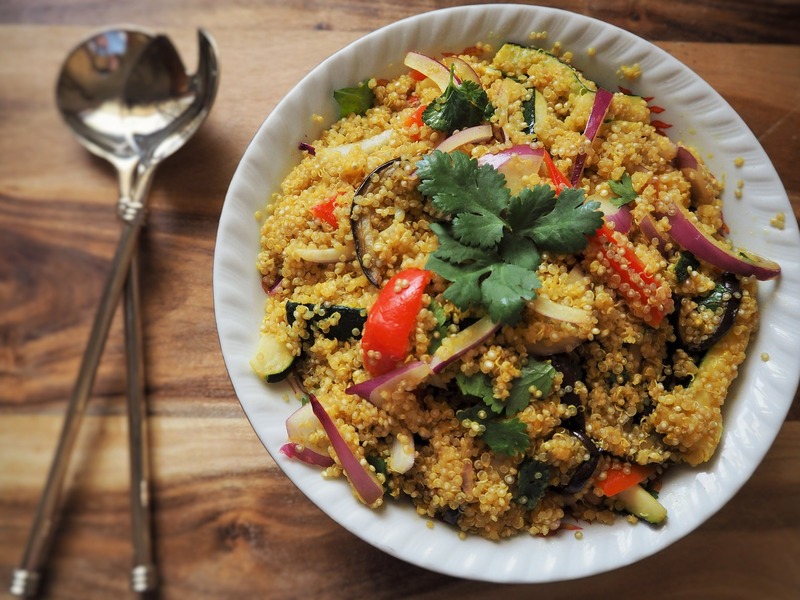 While the quinoa is boiling, prepare the salad dressing by warming the olive oil in a clean skillet over medium heat. Stir in the feta till it becomes soft and creamy. Then stir in the other salad dressing ingredients until the garlic is fragrant and its warmed through, about another minute. In a large salad bowl, toss the arugula, red bell peppers, onions, cranberries, pumpkin seeds and walnuts together well. Stir in the warm quinoa, add in the warm potato cubes and onion wedges and toss everything together with the warm creamy feta dressing. In a mason jar, combine all dressing ingredients and give it several vigorous shakes, until well blended. Allow it to sit for 30 minutes or more so the flavors infuse. Boil water in a sauce pan. Place the kale in a steamer basket, and steam the kale over the boiling water for about 4 minutes, until soft and wilted. Remove from the heat and place in a bowl. Toss with the salad dressing, carrots, peanuts, sesame seeds, and avocado. In a mason jar, combine all salad dressing ingredients, shake well and allow to sit to infuse. In a large bowl, toss together the lettuce, tomatoes, peppers, jalapenos, purple onion, cucumber, avocado and cilantro. In a separate small bowl, combine all seasoning mix spices. Heat some olive oil in a large skillet. Add in the white onion and sauté until translucent. Add in all the beans and corn kernels, add in the seasoning mix, and continue tossing and sautéing everything until slightly brown in some spots. 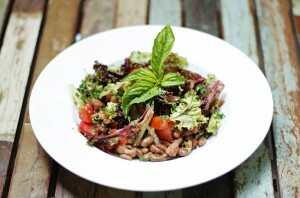 Scoop the warm beans, corn and onion into the fresh salad.